Dental treatment under the microscope, Endodontics – Dental Clinic "FREEDENTS"
Treatment and prosthetics under the microscope. Modern Dentistry is constantly appears something new and innovative, aimed at improving the quality of treatment, in particular the use of the microscope provides enormous opportunities in dental practice and to achieve more a high level of quality of treatment we use dental microscope. Microsoft is able to significantly improve the quality of treatment. 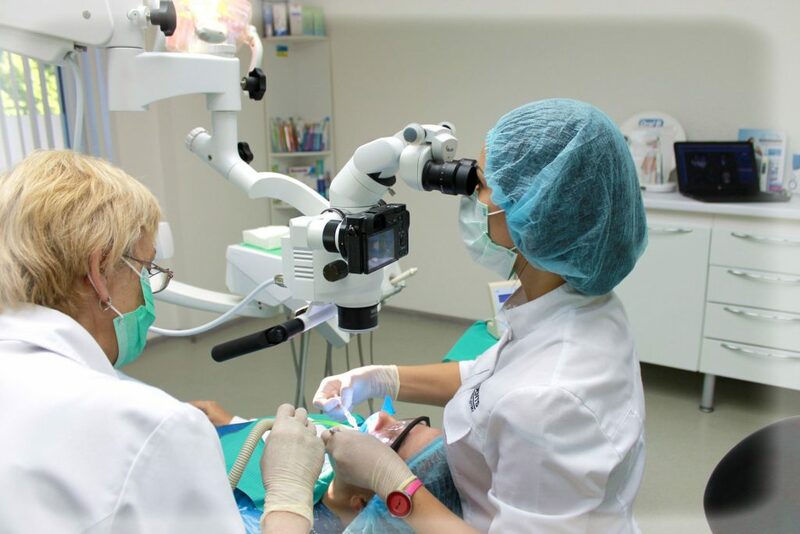 Advantages of treatment with application of microscope:-high precision in the work of the doctor; -careful removal of infected tissues; -detection of hidden root canals and possible branches, cracks and defects of the teeth; -preparation with maximum preservation of tooth tissue; -Hermetic quality root canal filling. Root canal treatment under a microscope. Endodontics is the science of Anatomy, pathology and treatment of root canals. In view of the very complex anatomical structure of root system, a doctor without a microscope handles root canals almost blindly, that may entail a not very thorough clean channels from its contents (microorganisms and putridnyh masses) also a big chance that any channel can be skipped and not processed due to its complex structure, or it can be hidden to the naked eye. In the future this may entail as worsening process in the tooth, and the growth of kistopodobnyh formations around the root as a reaction to the remaining infection in the root system, which may not bother a long time, because often flows in the chronic form. And diseases in chronic form never bother, and almost always discovered accidentally during inspection and x-ray study. To avoid such complications and errors in the instrumentation, in modern dentistry, root canals treated only using dental microscope, the doctor sees the root canal system at 12 x magnification, more carefully conducted cleaning of canals, and this improves the quality of treatment and the sealing root channels hundreds of times, so your teeth will be healthy for a long time. Modern endodontic treatment is very time consuming and sensitive process that requires appropriate qualification and experience of doctors-stomatologists, specific knowledge, compliance with all modern protocols irrigation, instrumentation and obturation of root canals. The doctor must undergo special training on treating teeth with the use of a microscope, you need a special expensive equipment, instrumentation and materials for such treatment, because This medication has its own characteristics and different from how you performed earlier. Based on all of the above and formed the cost of such treatment.